Australian manufacturer of iceboxes and portable refrigeration. Evakool Heavy Duty 240 Volt to 12 Volt DC Power Adaptor (15 AMP), 5 year warranty. This AC Adaptor converts 240V down to 12V to run Evakool Fridges. The power adaptor features a 50 amp Anderson plug and a 50 amp Andersen to cigarette adapter. IP67 rating for protection against dust exposure and water resistance. This adaptor has a 5 year warranty! Power Adaptors are popular for when 240V AC mains power is available and you want to run 12 / 24 Volt DC appliances (such as 12V fridges) so you can conserve your battery power. This EP15-MW Evakool adaptor model is the size up from the smaller 10amp Evakool adaptor model. This larger model is therefore suited to all Evakool fridges including the upright RV fridge models. It is a higher spec'd adaptor and comes with a much longer warranty of 5 years. "Amazing value and service "
I have owned and used an Evakool fibreglass chest fridge full time for two years without a hiccup. I needed to upgrade to something more user friendly for full time use. Due to the no issues or faults with Evakool I decide to go with the evakool platinum 210 based of aesthetics and energy consumption. I couldn’t be happier with my decision. It looks great is super quite and very efficient. The build quality is also great. Was hands down the best price for the Evakool fridge I chose to purchase. It even came with a free eski....bonus. The delivery time was very reasonable and it was a pleasure dealing with customer service. After heaps of research for a fridge/freezer for our Coaster Motorhome conversion, the Evakool Platinum 210 litre is EXACTLY what I was looking for. Service and delivery, second to none. Awesome fridge very happy all round. The guys that I dealt we very helpful and professional and would definitely buy from them again. Very Impressed with the product,good size for our onsite caravan.Recommend EvaKool to anyone. I have a friend who bought the EvaKool 65ltr Fridge/Freezer after I told him about my purchase. Great customer service,very helpful with any questions I had. Recommend My Generator to everyone. We installed an Evakool Premium 210 litre recently on our houseboat, and are thrilled with it. It looks great, has given our kitchen a new facelift, keeps all of our food frozen and cold...and can do all of this using 12 volt! Very happy so far. Peter Walker from My Generator went out of his way to accommodate us. We live in Sydney and had to drive up to Port Stephens to take delivery. He understood the logistics and coordinated and followed up with the courier and our selves throughout the entire process. Can highly recommend his service. Thank you Peter! We will definitely be using My Generator again. 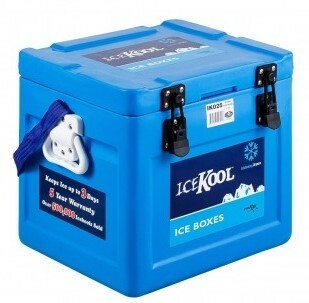 Icekool is the perfect combination of quality, durability and performance. Featuring a tough polyethelene cabinet and Evakool's superior insulation Icekool iceboxes can hold ice for up to 3 days (dependant on quantity and quality of ice and ambient temperature). 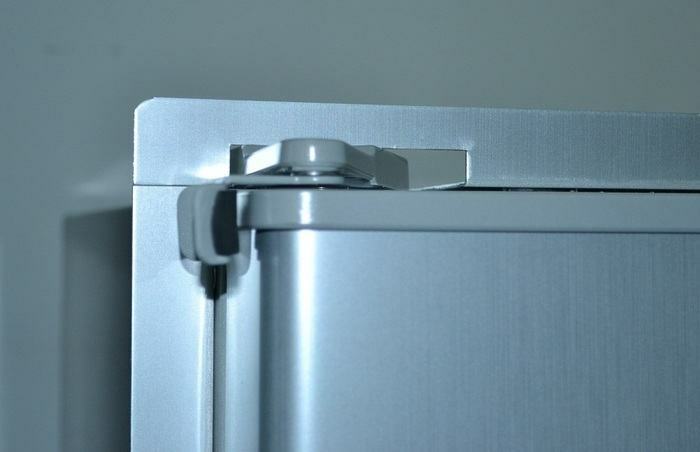 Aluminum mounting kit to suit Evakool upright fridge/freezers, 25mm. This kit is designed to neatly secure your fridge in the cabinetry of your RV / Caravan. Evakool Platinum 210 Litre 12/24 Volt Fridge, designed for Recreational Vehicles, 2yr warranty. Evakool’s Platinum Upright RV Fridge series delivers exceptional performance. The Platinum range of stylish, upright fridge freezers have been designed by drawing on Evakool's years of experience and extensive knowledge of 12 volt refrigeration. Evakool has developed a range of upright fridge freezers specially designed to provide maximum cooling capacity in our harsh Australian environment. In fact, the Evakool upright Platinum Fridge range can operate in temperatures up to and above 45 degrees celsius! The insulation thickness of their walls and doors, along with the externally mounted condensor design makes this range a popular choice for recreational vehicles heading in to hotter climates. Whilst the Platinum 12/24 Volt Upright Fridge series is perfect for your Recreational Vehicle, it is also worth noting that the range is free standing, meaning that it does not have to be built-in to cabinetry like other RV fridges - this also makes the Evakool Platinum range an appealing option for 'Off-grid' living requiring 12/24 volt appliances. WHY CHOOSE PLATINUM UPRIGHT CARAVAN FRIDGE FREEZERS? This fridge runs on 12 or 24 volt DC power. To run the fridge from 240 Volt mains power, you will need use a Power Adaptor (see Accessory List above) - these are popular for when AC mains power is available and you want to run 12 / 24 Volt DC appliances. Refer to the Product Manual / Installation Guide for installation instructions from the manufacturer. For optimal performance of RV compressor fridges, we recommend allowing a minimum of 10-20cm behind the fridge / cooling unit and have an extractor fan or install a bottom and top vent if possible, to force the warm air generated by the fridge to escape. As a general rule: The more ventilation you have, the better. Good size fridge can just fit 3L milk in door panel, running perfect for 3 weeks now battery back on float by 11am 2 x 200watt panels, bit noisier that small Engel I was using before but it is a lot bigger. Installed on the 15/8/2018 working very well so far. All nice and cool very happy with my Evakool fridge. After mounting my new 210 litre platinum fridge/freezer in my caravan I would rate it at 9.5 out of ten . Looks good & thick insulation, easy to install & will do the job quite well. Very professional & helpful, did what they said they would & was shipped quickly. Only problem was TOLL, fridge picked up Tuesday 9/4 from & notified us delivery by Friday 13/4 but delivered on Monday 16/4 after we chased toll for delivery. Great quality fridge. Nice thick insulation. Kept food and drinks nice and cold in 33c. The only thing I'd criticise is that it doesn't have any anchor points for tying down. Another business in Sydney recommend My Generator. We'd had good service from them so decided to with their recommendations. We are glad we did as the transaction was pleasant, easy and fast delivery. I would certainly recommend it to others. Quality of the 210 lt Evakool fridge is very high and performance alike. Maintained our food at very good temperatures during 34 degree heat. My shopping experience was very pleasant and helpful with regards to product information and delivery. It was the only fridge that would fit in the hole. I had no problems they did as they said and sent it when they said. Great 12/24 volt fridge freezer. Price quite high for a RV fridge though. The people that I dealt with seemed to be knowledgeable about the product and very easy to deal with, they did not try to push the sale which is very important to me. I swapped the 3 way Dometic fridge which came in my van because I was unable to get a relatively level parking spot whilst I spent about 5 hours looking around a museum. When I got back to the van for a cool drink the fridge had defrosted and everything in the freezer was thawed out. It was running on gas at the time and the temperature in the van was about 30 degrees. Since changing to the everkool unit I have had no problems at all even with higher ambient temperatures. It is so nice not to have to remember to keep swapping between 12v and gas when you stop the towing vehicle for any period of time as well as back to 12v when I set off again. The fridge only draws about 5 amps at 12v and my 400watts of solar panels and 2x 130ah batteries have never had any problems running the fridge. Another added bonus was being able to vent the fridge inside the van and seal the external vents which has dramatically reduced dust entry into my van on dirt roads. I found My Generator to be very helpful and they had the best price I could find anywhere on the fridge I purchased from them. Prompt emails were sent keeping me informed on the progress of the transaction and delivery process. I have nothing but praise for them. Q:Please advise if this model advertised has the shelf in the freezer? Many thanks. Hi Phillip, yes this model does come with a shelf in the freezer compartment. You can see on the product page within the Videos tab there is a product video showing the freezer with a shelf inside. Hi Carol, great question. This Evakool model has a rated power consumption of Approx 2.1 Amps/hr at 32°C ambient temp (with Fridge setting at 4°C & Freezer at -15°C). So you would just need to ensure your solar set up / batteries can supply that minimum 2.1 Amps / hour requirement. To help you further; Its best to use the solar panel to charge a battery, as opposed to running the fridge directly from the solar panel as voltage will drop if clouds come overhead for instance. The battery means your refrigerator keeps running even if the voltage output of the solar panel drops severely due to cloud cover. A good rule of thumb to prevent inadequacies with power supply is to have a solar panel large enough to provide enough daily power to run your refrigerator, and have battery storage of an extra 2/3 (approx.) on hand. A popular sized battery for recreational applications like yours is around 120amp and your sized solar panel at 250 watts should be a good fit to ensure you are keeping that sized battery charged enough to comfortably run your fridge and maybe some other small appliances if required. Q:What plug is used for 12v operation? (or is it hard wired?) Also, how does it run on 240v power? Hi John, the unit comes with a 2 position terminal for hardwiring the fridge to DC power. To run the fridge from 240 Volt mains power, you will need use a Power Adaptor (see Accessory List on product page) - these are popular for when AC mains power is available and you want to run 12 / 24 Volt DC applainces. Q:How much solar & battery power is needed to run this unit? Does the fridge draw up to 12amps every time it starts up? If this is for a caravan, Evakool recommend that you use 300 watts or more of solar panels and 200AH or more of battery power. If you are using the fridge for an off grid solar application, you should use 400 watts of solar and a 300AH battery bank. Yes, the fridge does draw more power when it first starts and will be close to that 12Amp mark. As the refrigerant cools, the power draw will be closer to 10Amps. Q:Hi, I’m looking at an Evakool upright fridge for our van. What are the differences between the Evakool Platinum models and the Evakool Elite models? Hi Stewart, great question. Evakool released their new Elite Fridge range in April 2018, whereas their Platinum Fridge models have been around for a few years and have been very popular. The success of the Platinum range has been largely due to Evakool's focus on ensuring these RV fridges will still perform at maximum cooling capacity even in the hottest of temperatures. The insulation thickness of their walls and doors, along with the externally mounted condenser design makes this range a popular choice for recreational vehicles heading in to hotter climates. - In the 2 larger Elite models (EL145 and EL208) they come with 2 compressors allowing you to turn off either of the compressors if not required ,thereby reducing power draw. Reduced demand on each compressor when operating in higher ambient temperatures, as opposed to having one compressor to cool both the fridge and freezer. This provides confidence that if travelling and one compressor was to fail that you can still use the other compartment. Because the cabinet is so well insulated the compartment for which the compressor has failed can still be used as an icebox / cooler. - Like the Platinum range, the Elite range has exceptional performance in high ambient temps as both the fridge and freezer have a dedicated compressor. ...The above points are some of the main Specification differences between the two ranges. There are other features for each model (e.g. size, colour, freezer capacity, power draw etc.) which you can view on the product pages for each individual model. Both ranges use the universally renowned Secop (Danfoss) compressor, come with a 2 year warranty and are supported by national service agent networks. Overall, we have no hesitation in recommending Evakool Upright RV 12/24V DC Fridges (both the Platinum and Elite ranges): they are a great option designed for: Motor Homes, Caravans, Camper Trailers, Boats and other recreational vehicles...they can also be used within 'off grid' homes relying on 12 volt and solar power. Q:What type of compressor is used in the Evakool Upright Fridge models? And, what are the benefits of these? I want a Caravan Fridge that will perform well in the heat up north. Thanks. Hi There, all of the Evakool Upright models (both the Platinum and Elite range) use the Secop PBC 2.5 (formally Danfoss BD50). Note that the two larger Elite models actually use 2 x compressors. See separate Q&A regarding the reasoning behind having 2 compressors and why this might be beneficial for RV owners. Re the actual compressor mode - Not too many people know, that the Secop compressor is a 4 speed compressor. At its slowest speed, 2000RPM, it’s rated at 42 Watts of cooling and at high speed, 3500RPM, it’s rated at 71.6Watts. Most of the power consumed by any fridge is on start up, as the motor is trying to turn over; the amps can rise to as high as 10 amps then settle as it comes up to speed. Evakool have programmed the compressor to soft start, drawing the least amount of amps as possible. Most manufacturers set their fridges at 1 speed (normally high speed) resulting in very high amp draw on each start up, adding greatly to the overall power consumption. Once the fridge has soft started then the electronics will automatically select the right speeds to handle the load given. E.g. In winter where there is very little heat load it may only use the slower less power consuming speeds to achieve temperature , saving even more power than if it was pre-set at one high speed. Q:What type of condensers are used in the Evakool Elite Fridge models? Pros: no moving parts. Doesn’t need cleaning. Cons: not as efficient in expelling its heat in high ambient temperatures. Pros: super efficient. Very small, normally the same size as the fan. Cons: needs cleaning. If blocked with dust or the fan fails, the fridge will stop working all together. What Evakool has done on the ELITE is to combine the two! They have used the fan that cools the compressor electronics, to pre-cool a section of the condenser before it goes into the passive section. The result is that the fridge can operate more efficiently in hotter temperatures, it doesn’t need cleaning and if the fan ever fails, the fridge will continue to operate. Q:Why is the fault light on my Evakool Fridge flashing? 1 Flash - Battery protection cut-out (The voltage is outside the cut-out setting). 2 Flahes - Fan over-current cut-out (The fan loads the electronic unit with more than 1Apeak). 3 Flashes - Motor start error (The rotor is blocked or the differential pres-sure in the refrigeration system is too high (>5 bar)). 4 Flashes- Minimum motor speed errors (If the refrigeration system is too heavily loaded, the motor cannot maintain minimum speed at approximately 1,850 rpm). 5 Flashes - Thermal cut-out of electronic unit (If the refrigeration system has been too heavily loaded, or if the ambient temperature is high, the electronic unit will run too hot). Q:Does my Evakool Fridge come with circuit breakers? Thanks. Yes, each system has been fitted with a 15Amp circuit breaker to protect the circuit and electronics. Q:Hi. I like the idea of 2 compressors in the 2 larger elite series fridge to be able to reduce draw by turning one off when not in use, but i need a fridge at the bottom with freezer at top at the top. Will this option be available?